When it’s time to make a purchase, this can make a big difference in the customer’s decision. It can set you apart from the others who don’t have the stamina to serve. But to make this work, you have to make a commitment. A “toe in the water” strategy isn’t going to cut it. 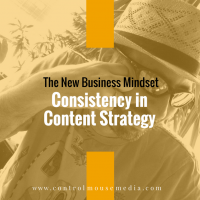 You’re in it for the long game: Consistency, persistence, and the patience to let it grow organically. Let’s find out in this week’s program, Episode 97. Listen here or subscribe in iTunes. I mentioned in the episode an introductory offer of 50% off for charter members – this offer expired at the end of July 2017. But here’s an exclusive offer for listeners of this podcast: 20% off the membership fee. Use this link to get the discount: controlmousemedia.com/mwm. The course is 42 video modules, with dozens of worksheets, templates, and guided assignments. Here’s a preview of the complete course outline. 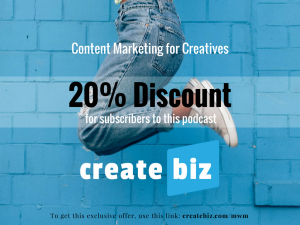 It’s designed to help creatives of all types build a business around their work, using the soft-touch marketing approaches that I teach in this podcast. It can feel like serving rather than selling, which is not only more palatable – but can be more effective, too. Published June 19, 2017 by Michael Boezi.